Do you want to make your own Apple Juice? 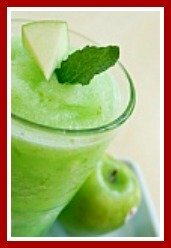 Here are the best juice recipes for juicing with apples, including other fruits and vegetables combined with apples for juicer machines. Juices and blends have become increasingly popular in recent years. They fit very well into busy, modern lives, enabling us to incorporate healthy habits into everyday routines. Homemade fruit and vegetable juices are easy to make, quick, convenient to take "on the go" and packed full of rejuvenating, healing and revitalizing nutrients. They are also scrumptious, and a luxurious blended drink can feel like a real treat! Juices are a great way to encourage kids and teens (and adults!) to ensure they receive the recommended daily requirements of fruit and vegetables. Everyone loves specialty juices! Kids, even those who loathe eating their fruits and veggies, and have to be cajoled into eating a piece of fruit - love them. There is much overlap between juice recipes and smoothie recipes. Why not check out the scrumptious, healthy smoothie recipes link below? ﻿If you are planning to include mixed greens in your drink (for example, kale), try using a ration of about 25 percent mixed greens to 70 percent fruits and vegetables. If you prefer the option of separating the juice from the fruit and vegetable fibre, then you should purchase a juicer machine that includes this option. While you can buy ready-made juices, nothing beats the amazing taste of a blend made right in your own kitchen! Freshly made juices are also a more potent source of nutrients and it is reported that the antioxidants found in fruits and vegetables work most effectively when they are consumed together, and juicing makes this very idea possible! YOU control what goes into your juice! Click on the images below for more detailed product information and customer product reviews at *Amazon.